Kuroji Shitodo (鵐　黒巫鳥, Shitodo Kuroji) is a serious and taciturn person who specializes in lots of fields of study, including prehistory. They are a recurring character in the Len'en Project, first appearing as the stage 5 boss of Evanescent Existence and later appearing as a playable character. Kuroji is the oldest sibling of Hooaka Shitodo and Aoji Shitodo, who all live in Mugenri. Kuroji and their younger siblings once lived in the Outside World. While Hooaka and Aoji were powerful and competent magicians, Kuroji was just a normal scholar. They have also been a military strategist in the past, but aside from having great discomfort about the subject of war, their reason for leaving is unknown. They seem to have known Yabusame and Tsubakura since they were young and Kuroji was always jealous of how Tsubakura always surpassed them at everything. This made Kuroji develop a inferiority-superiority complex towards them. Kuroji is ambitious and greedy and is referred to everyone as a lowly scoundrel. They are obsessed with easy ways to get money and is quick to come up with amoral plots to maximize profit. They have no qualms in stealing money from youkai or fellow humans and is willing to sell even their own allies. With each incident, Kuroji becomes more and more jaded, to the point they eventually start losing integrity when they decide to gain more power and money by manipulating everyone they know into getting them what they want. Around their own circle of friends, Kuroji can be dominant, overconfident and has difficulty expressing sympathy. Even their closest "friends" (such as their siblings or Saragimaru) consider them to be amoral, self-centered and unable to care for others. But apparently, their "immoral scoundrel" act is actually just an act, and Ooama no Ake no Mitori claims that Kuroji is not as egotistical as they claim to be, while Tsubakura states that they fuss over others and are actually a good, considerate person (at least sometimes). According to JynX, Kuroji isn't actually self-centered, just contradictory and likes to get on people's nerves. Kuroji has shown several times that they do care for others, in their own twisted way. For instance, while annoyed at their siblings lack of participation upon moving to Mugenri, they still care for them and want to raise a schoolhouse in Mugenri so that they could work on it together. They mistreat Adagumo no Saragimaru and blackmailed them into subordination, but Kuroji has admitted openly that they like the orochi even if the feeling is not mutual. Kuroji is very smart and knowledgeable in many areas. It seems that prehistory is their forte, but besides that, they dabble in other fields of study as well. Kuroji is especially antagonistic towards Tsubakura and is jealous of their talent. Unlike most of the outsider humans, Kuroji has fully embraced the lifestyle in Mugenri and uses their newly discovered powers to cause mischief around Mugenri and do things as they please. It's implied that Kuroji has a complex on becoming special, since unlike their siblings, Kuroji was a normal powerless scholar in the Outside World. They're able to reverse the front and back of things, to an extent, as shown in their spell cards. But because they only acquired that power upon arriving to Mugenri, they aren't very good at it. Although not as good as Tsubakura Enraku, Kuroji also has some technological weapons of their own. For example, their shooting type in-game are little robotic birds that shoot lasers and a bomb composed by a virus, the RNA "Retrovirus". Their character may be a homage to Sanae Kochiya . Both are new to the magical land they find themselves on and they live in a family of three. They both also work as youkai exterminators to advertise themselves. 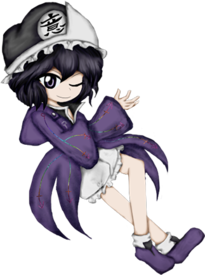 Kuroji's other homage is Seija Kijin . Both have similar abilities and personality. Their full name is Kuroji Shitodo (鵐　黒巫鳥). Kuroji (黒巫鳥) is the Japanese word for the grey bunting, a kind of bird. Kuro (黒) also happens to be the Japanese word for black. Their family name, Shitodo (鵐), uses a kanji which is used in an alternative Japanese spelling of the black-faced bunting bird. Despite being one of the oldest outsider humans, Kuroji is quite short in height (said to be one size smaller than the already shorter-than-average Tsubakura Enraku in the prologue of Brilliant Pagoda or Haze Castle). They have short wavy black hair and black eyes. In all the games, they wear the characteristic Shitodo outfit: a black necktie and puffy shorts with a long, hooded, purple jacket. They also wear a black and white mob cap on the front of which is a hitaikakushi with a black kanji written on it. Each game so far has featured a different kanji on the hat (考, 思, 想, 意); the kanji featured is always a synonym for "thought" or "thinking". The kanji on Kuroji's hat in the 2017 Christmas illustration is 聖, meaning "holy" or "saint". Like everyone else, Kuroji and their siblings are spirited away to Mugenri. They were placed into a specific airspace by Tsurubami Senri. Kuroji realizes that they now have the ability to reverse things and is trying out their new powers. Along the way, Kuroji meets their rival Tsubakura Enraku, impersonated by Tsurubami Senri. Noticing that "Tsubakura" might know something about a way to escape Mugenri, the two fight, but Kuroji is defeated. The scholar realizes that there is something wrong and Tsubakura is behaving differently, not realizing that this is an impostor. Later, they run into Yabusame Houlen who asks for Tsubakura's location. Being disagreeable as always, Kuroji refuses to say anything and the two fight, but they are defeated again. After being defeated, Kuroji tells Yabusame to go to find answers in "a sun that casts a shadow", that turns out to be a portal to the Senri Shrine. Kuroji reunites with their siblings and settles in Mugenri afterwards. Kuroji and their siblings have settled up in Mugenri but have trouble adjusting to it. They built a shabby cabin for their siblings to live, but it's slowly falling apart and their siblings are too dependent on them, much to Kuroji's chagrin. In order to have some funds, Kuroji decides to install a schoolhouse, but first they need the money for it. So they decide to resolve the incident. After dealing with a few youkai (and stealing Hibaru Kokutenshi's money), Kuroji finds themselves in a ritual chamber, where Adagumo no Yaorochi and their partner Sukune Katano are. The two were gathering the spiritual energy of the weather to restore a replica of the Tasouken sword, but Kuroji stops them before they complete it. However, after Yaorochi is defeated, the sword attacks Kuroji on its own. Fortunately, the clay vessel was too much for the Tasouken and it stopped. After everything was cleared, Sukune reveals that the clay replica is actually a sword-shaped bottle opener, much to Yaorochi's chagrin. In the end, Kuroji makes fun of the orochi because of their poor communication and asks Sukune to treat them for sake. Days later, the clouds return to Mugenri. Annoyed at the drunk people in the shrine, Kuroji goes to investigate. After dealing with an empowered Lumen Celeritas, Kuroji encounters the orochi Adagumo no Saragimaru, Yaorochi's younger sibling. They want revenge for having defeated their sibling and ruining their happiness, so they lured them into a trap. Kuroji tries to reason with Saragimaru, but in the end, they agree to fight. They have a battle and Saragimaru is defeated. Since Kuroji is sober, they invite the orochi to have a drink. Kuroji, while advertising in the Capital City, finds a signboard directed to Fujiwara no Iyozane, in which they offer souls in exchange for money. On the way, they bump into Adagumo no Saragimaru and forces them into cooperation, blackmailing them about telling Yaorochi about Saragimaru's stalking. It's revealed that Kuroji didn't accomplish anything by defeating Yaorochi in the previous story and has retorted to stealing youkai's money to gain money. After dealing with youkai in the way as they recollect spirits, they meet the person who the signboard was directed to, Fujiwara no Iyozane. When they finally find Iyozane, the boatman reveals that they're working to resurrect someone important and there wasn't a payment to begin with. Angry for wasting their time, Kuroji and Saragimaru go to ruin said ritual. They find Taira no Fumikado, who was trying to collect spirits for their resurrection ceremony, since they want to resuscitate the vengeful spirit Taira no Masakado and store him in their homunculus body. After defeating them, they find out that all the spirits are attracted to a certain location. Finally, they end up in the Withered Grove, where they find the chimera soul Shion, who is the avatar of the soul-eater flower Harujion and was absorbing spirits, causing a long winter. Kuroji decides to steal the flower in order to sell it and Shion fights them in order to protect the Harujion. In the end, Kuroji and Saragimaru arrive at the Senri Shrine, bringing Shion with them. Shion is interested in Tsubakura's soul and stays at the shrine. Kuroji wants to sell the remaining spirits to collect money while Saragimaru is worried about the amoral things Kuroji does to get profit and decides to keep an eye on them. Days later, Jinbei tells the group that the spirits came to Mugenri because of a hole in the Mugenri Barrier that separates the land from the Outside World. The hole was caused by Lumen, during the Clouds Incident and Tenkai Zuifeng was tasked to repair the hole, but is taking too long. Out of greed, Kuroji asks Tenkai to stop the reparations of the barrier in order to capture more spirits. On the way back home, they are ambushed by Sese Kitsugai, a youkai they had defeated at the beginning of the story. Sese absorbs the spirits the heroes had been recollecting, much to Kuroji's chagrin, who wanted to sell them. After Sese is defeated, the spirits leave Sese's body and Kuroji orders Saragimaru to retrieve them. Suzumi Kuzu barges into the Shitodo House and attacks the Shitodo siblings, resulting in Hooaka's arm being severed. With their ability to rewrite memories, the Shitodo siblings forget about the encounter, but for some reason they remember the words "The mirror of Heaven shall split". The siblings go to the Senri Shrine to treat Hooaka's injury and inform Yabusame and Tsubakura about the words. Kuroji doesn't care about the upcoming war but decides to take advantage of it gaining more money (even though they already have the amount they wanted for the schoolhouse). Since Saragimaru ran away from the Shitodo House to assist Yaorochi, Kuroji goes with Aoji and Hooaka. It's revealed that after failing to sell the spirits gathered during Reactivate Majestical Imperial, Kuroji has resorted to stealing money from either humans or youkai and has stolen Fumikado's financial support off-screen. Kuroji is now infamous around Mugenri, but Kuroji doesn't care about that and is actually happy that they're known. In all routes, Kuroji and their siblings deal with a few youkai and some of their human acquaintances, trying to steal valuable things in the process (such as the Harujion or Yaorochi's Tasouken). At the end of the Brilliant Pagoda or Haze Castle routes, Kuroji and their siblings find out about the war sides and the motives of the Imperial Military and the Dragonfly Army, but Kuroji decides to stay out of it, stating that they only care about their own well-being and doesn't care about what happens to Mugenri. Also, Kuroji is worried and has the feeling that they may have forgotten about something terrible. In the end, they meet Suzumi again, forcing the Shitodo siblings to remember they were attacked by Suzumi earlier that day. Suzumi reveals their intention to make Tsubakura's life a living hell and after a hard fight, Suzumi erases their memories again (with Aoji being the only one who vaguely remembers). Kuroji cares about their younger siblings and provides the house, food and money for them. However, sometimes Kuroji gets annoyed at their lack of ambition and easygoing attitude. On their side, Aoji and Hooaka clearly are uncomfortable with Kuroji's amoral methods to gain easy money, but they'll help them nonetheless. Kuroji and Tsubakura hate each other because of their arbitrary ways of thinking. Kuroji is secretly jealous of Tsubakura's talent. Their interactions consist of polite insults and sarcastic remarks. On the other hand, perhaps due to knowing each other for a long time, Kuroji is worried about Tsubakura at times. For example, Kuroji is horrified when they find out that Shion consumes Tsubakura's lifespan on a daily basis. Also, they believe that Tsurubami Senri doesn't have good intentions for Tsubakura. It seems Kuroji trusts Tsubakura, since they went to them when Hooaka was injured by Suzumi. Although Yabusame is Tsubakura's best friend, Kuroji actually seems to get along with them and calls them "Yabusame-kun". Yabusame doesn't mind the animosity between Kuroji and Tsubakura and is on friendly terms with them. On the other hand, Yabusame does consider Kuroji to be vicious and self-centered, like everyone else. Kuroji likes Saragimaru because of their strength and straightforward, down-to-earth personality. However, Kuroji is willing to blackmail the orochi into cooperation or sell their identity. Since Reactivate Majestical Imperial, Saragimaru works as Kuroji's unwilling servant, something the orochi is not happy about. Saragimaru considers Kuroji a contradictory and vicious scoundrel who gets away with everything. Kuroji doesn't mind such things, but when angered enough, they will not hesitate to remind Saragimaru of their blackmail. The two are generally on "friendly" terms, and it's suggested that Kuroji cares about them in their own way, such as helping them to hide from Yaorochi. Kuroji's age is unknown, but conversations in-game imply that they're older than Yabusame Houlen and Tsubakura Enraku. Among the three Shitodo siblings, Kuroji is the only one who only acquired their powers upon arriving to Mugenri, rather than already having any before. Hooaka Shitodo's nickname for Kuroji in Brilliant Pagoda or Haze Castle, Kuro-jii (黒じぃ/クロじぃ), is a portmanteau of the words black (黒/クロ) from their name, and old man (爺, Jii), making fun of Kuroji's age.